Supplier & Manufacturer of Centrifugal Chemical Process Pump & Centrifugal Chemical Process Pump (Closed Type). Our product range also comprises of Polypropylene Chemical Process Pump, Industrial Valves. We are the supplier and manufacturer of Open Type Centrifugal Chemical Process Pump which are manufactured with ultra specific quality raw material. 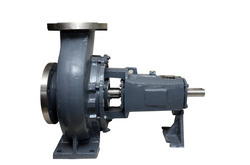 These pumps contain very rigid construction with extra wall thickness. This pump gives you unusual protection against highly corrosive chemicals. 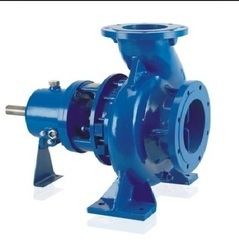 The solid molded casing and impeller ensure a smooth running pump for long life and a minimum of wear. all pumps, shafts are fitted with sleeves of different materials compatible with the liquid handled. We are leading manufacturer and exporter of Chemical Process Pumps based at Ahmedabad, India. We have an entire range of products under the centrifugal pumps category. "JEC" Chemical Process Pumps are of the single stage, horizontal end suction type, with semi-open impellers. The semi-open impellers are used/supplied where liquids, containing solids, or have a tendency to polymerize or crystallize. A special feature is easy of maintenance due to the foot-mounted volute casing, permitting removal of the rotating assembly without disturbance of pipe connections. An extensive choice of materials of construction is offered to enable a wide range of chemicals to be handled. The casing assembly is hydrostatically tested to a minimum of 1.5 times the shut-off pressure. Additional non-destructive testing procedures are carried out as standard practice on all pump parts. We offer a wide range of Centrifugal Chemical Process Pump. These pumps are Semi Open Type. Polypropylene Pumps Series -PPC is a Non-Metallic horizontal single end suction standardized back pull out process pump. JEC Polypropylene pumps are supplied with mechanical seal / gland packing arrangement covering 85% of the chemical industries requirement. The pumps are manufactured from polypropylene copolymer-a chemically inert thermoplastic by the use of an exclusive moulding process. Max Flow Rate 700 M.cu/hr. 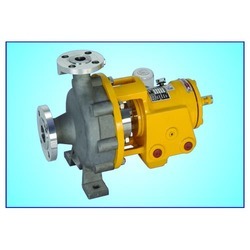 We are leading manufacturer & exporter of Centrifugal Chemical Pump. "JEC" Centrifugal Chemical Pumps cover a range of capacities extending to 700 M.cu/hr. at 1450 rpm, and 300M.cu/hr_ at 2900 rpm. Head range up to 145 meters. Design pressures to 25 bars and process temperatures extend from -40°C to +300°C, depending on the material of construction. All parts that come into contact with the liquid are made from Cast iron, Ductile iron, Rubber Lined, Cast steel, Bronze, Ni-Resist, Ni-Cast iron, Stainless steel, Alloy-20, R.52, R.53, R.55, Hastelloy-C, Hastelloy-B and other Alloy grades as per operating conditions.